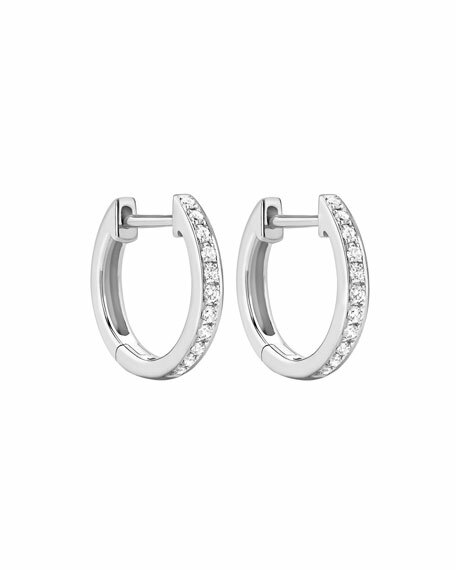 Kiki McDonough hoop earrings from the Kiki Classics Collection. Approx. 0.5"L x 0.1"W (12mm x 2mm). Kiki McDonough fine jewelryacclaimed for vividly colored semiprecious stones, 18-karat gold, radiant diamonds, and unexcelled craftsmanshiphas been spotted sparkling on British nobles for the last quarter century. McDonough's singular ability to use classic media to craft rings, bracelets, necklaces, and earrings with a contemporary sensibility continues to attract customers to her shop located in London's famed Sloane Square. The Victoria and Albert Museum has a pair of her earrings on permanent display in their modern jewelry collection, giving the luxury brand an enduring global presence.